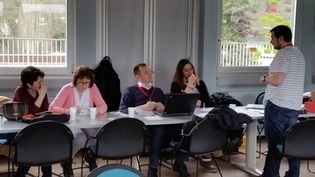 We’re just back from a playful coding EU Erasmus+ meeting in Le Creusot, France. The project is really coming together now: we’ve been up and running for nearly a year and the project website now has a lot of content and we’re beginning to pull together a teacher’s guide. The aim of last week’s meeting was to look at how different people implemented the activities in different contexts, to check that the information we have is good enough for people to pick up and use our workshops, and to think through next steps for the teacher’s guide. It’s been a busy week of thinking, talking, writing, teaching, and testing workshops on local kids. 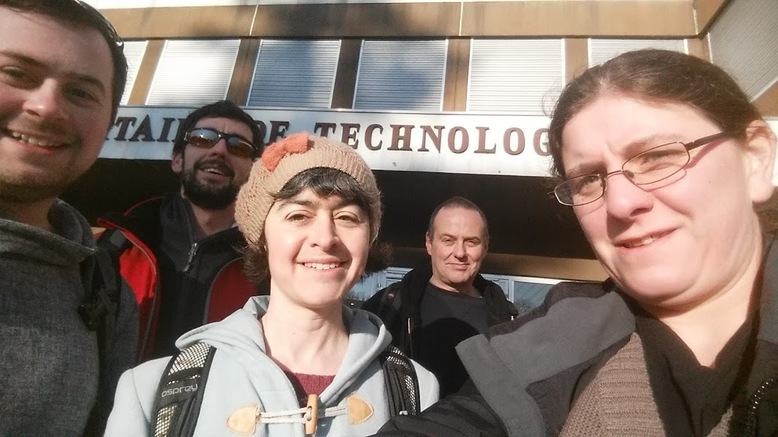 We were lucky to be able to take four people from Aber Uni this time: myself, Wayne Aubrey (who’s been to the last two meetings so now knows the project well), Amanda Clare, and Mark Neal. We also travelled with Tomi from a local high school (Ysgol Bro Hyddgen). Here’s our traditional “arriving at the meeting” selfie. For much of the week we were sat in a meeting room discussing the content of the workshops, the presentation of the workshops, and different ways we can organise these so that teachers can make the most of the materials we’ve produced. (answer: it might not be possible, as there’s a real range of activities ranging from beginner’s workshops linking poetry with animation, aimed at 8 year olds and extended workshops talking about plot development and story structure as well as coding, aimed at older kids through to Arduino and other robotic stuff like this workshop which requires specific kit and teacher skills. We did some practical workshops, with local kids, as well as talking about structure and organisation and plans. I ran a workshop on Artificial Intelligence, which was quite the challenge: 12 kids, under 10, all French. My French is quite good, but not quite good enough to discuss philosophical ideas about intelligence and the Turing test with under-10s. 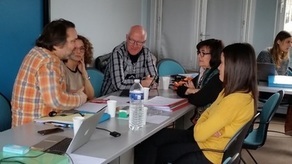 But I gave it a good shot, and had some very welcome linguistic support from the local Le Creusot team. 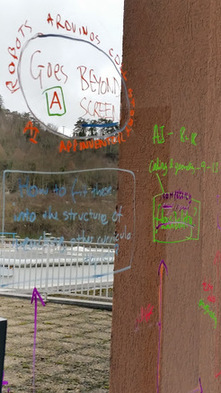 In the AI workshop we do a series of activities which explore ideas around intelligence and embodiment, and at the end of each activity we vote on the question “Can computers think?“. The aim is to get the kids thinking, not to get them to take a particular stance. Indeed my hope in writing the workshop is that people will consider ideas about what thinking is and what it means for a machine to be intelligent: the aim is to change some minds. So from that perspective the workshop worked. 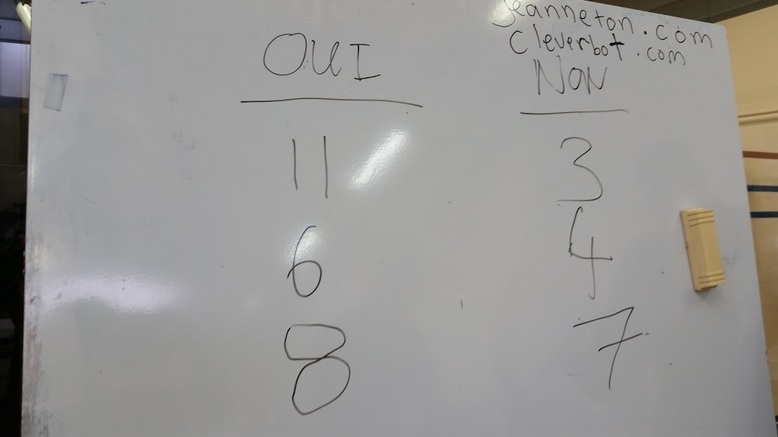 Top tip, though, if you want to run the workshop in France: the chatbot Jeanneton, whilst French, is probably not age-appropriate for 9 year olds. In each of the workshops we ran we also had observers, and I observed a robot workshop written by the French team. 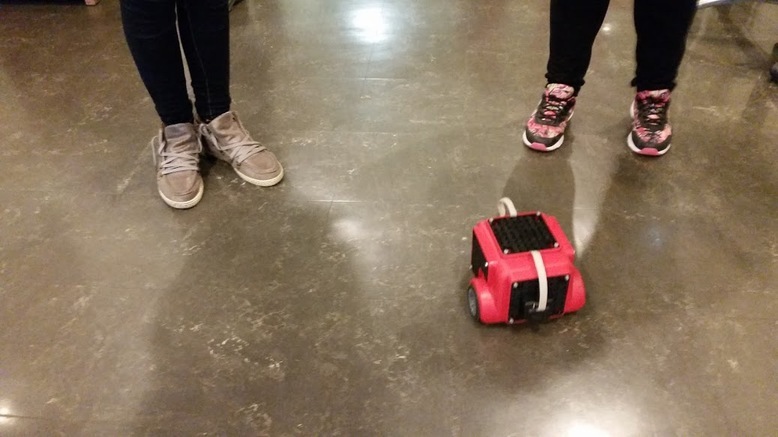 This was really very good fun – POB robots are drag-and-drop coding vehicles with some simple sensors, and the kids really got into it. 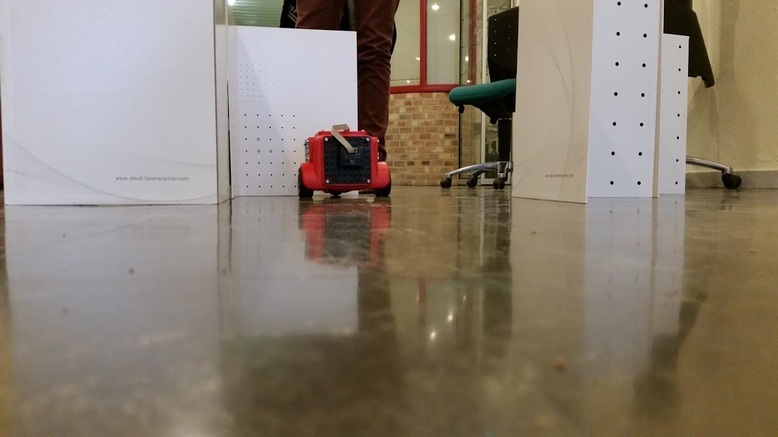 Here’s some pictures of the robots in action. In all, it was an interesting and challenging week which really made me think about schools engagement in a more structured way. It’s particularly inspiring to see the kinds of workshops that the other groups are proposing, and I’m really looking forward to hosting everyone in Aberystwyth for the next meeting in March.